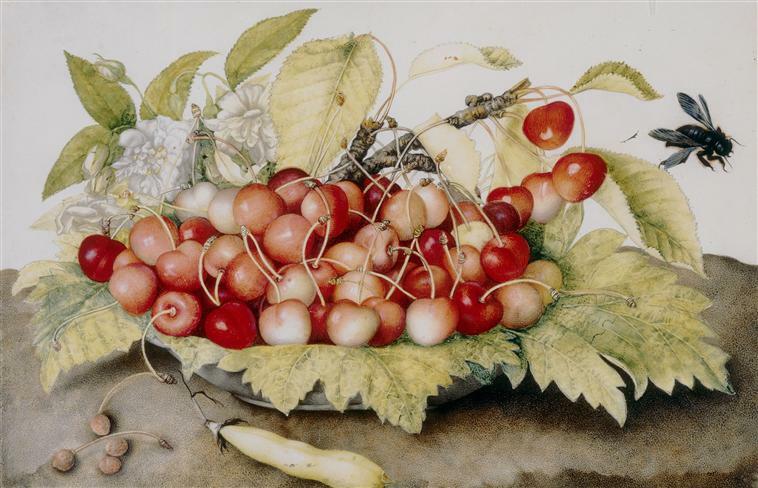 I am sitting with a bowl of cherries beside me and am reminded of the little-known painter, Giovanna Garzoni (1600 -1670). Garzoni spent most of her life in Rome painting vibrant still life paintings which were collected by her many patrons who appreciated her earthy sensuality and botanical realism. The fruits she painted are not idealized specimens, but real fruit, perhaps picked from trees nearby, with blemishes and crinkled leaves, even an occasional insect hovering. Her choice of watercolor and tempera rather than oils gives spontaneity to her paintings. Garzoni clearly loved to paint fruit. In common usage, the word fruit refers to the sweet and fleshy product of a tree or plant that contains seeds and is eaten as food. An apple, as well as mango or pear all fit this description. The botanical explanation is a little more specific — any part of a seed-bearing plant that contains the fertilized seeds that will produce a new plant. But I like the definition of fruit that comes from the derivation of the word — from Middle English, via Old French, from the Latin fructus meaning enjoyment. Giovanna Garzoni was also known as the chaste Giovanna. Though she married briefly, her marriage was annulled (you couldn’t divorce back then) because it had never been consummated. Her male biographer wrote that she took a vow of chastity; also, that her father thought her husband was practicing witchcraft and urged her to divorce him. These explanations seem a little confusing. It’s men, after all, who have written her biography. She was one of the few women in the 17th century who received an education and was financially independent. She worked in Venice, Florence, Turin, Naples, and finally settled in Rome. She traveled to Paris and London. Apparently her paintings were in so much demand that she could charge whatever she wanted. From my perspective, because of her dedication to her art, she knew that she needed to create a life where she could be free. Had she had children, she would not have been able to work full-time as a painter, traveling from city to city, often staying for weeks or months with patrons. Who can determine whether someone is chaste or not and what exactly does this mean? Who knows, maybe the chaste Giovanna was concocted so she could annul that marriage. Maybe she had women lovers — and they didn't count in those days. How do we know that she didn’t have secret trysts? After all, her subjects were rarely allegorical or religious, heady stuff, but fruit and nature, the tactile tangible world. And remember, the derivation of fructus is enjoyment! Her rapturous paintings certainly suggest that she experienced intimate connection with the 'other', with the world, and knew love and desire, betrayal and beauty. Unlike Cezanne’s art, her work did not influence the direction of modern art, but I think of her life and art as an inspiration, especially to other women artists. My email prompted her to look through more of Garzoni’s work. She described scrolling through her paintings as a decadent indulgence . . .
Cita’s Scott’s still life paintings of flowers and fruit make me think that they are revelers at a wild bacchanalia. In the painting above the apples tantalizingly touch each other, the pepper desires the eggplant, and the grapes are about to burst with juice. (You can see more of her work at citascott.com.) I don’t’ know if Scott would agree that Garzoni influenced her painting, but I certainly see a connection. And I am grateful that Garzoni’s art helped to reconnect us. When you next pick up an apple or cherry or grape, take a good look at it, it’s color, shape, substance, light — and, be a painter for a moment, appreciate its ecstatic presence. Then enjoy.